I hope y'all are having a fabulous week so far. As the title of this post indicates, I wanted to write a post to share with y'all a new way to wear your favorite scarf. 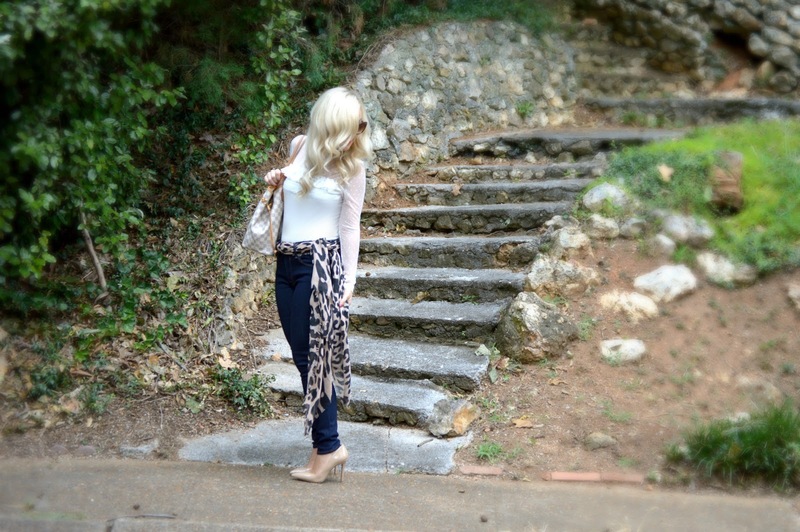 So far this fall, THIS leopard print scarf by BP has definitely been my fave! It is probably because it's a little lighter weight than most of the blanket scarves and we have yet to have super "cool" weather in TN so far. This scarf has gone with SO many outfits and I know it will be on constant repeat. Plus at the price, you really can't beat it! It probably goes without saying, but the key to wearing a scarf as a belt is to make sure it's not too thick. This wouldn't work well with a blanket scarf. However, this scarf by BP is not too thick to loop through the belt holes of my jeans. I was super excited to play with a new way to wear a scarf! What are some of YOUR favorite spins on classic fashion trends?! Leave me a comment below and let me know!